Please note that each section of the Summary is a link to its corresponding section in the full article. 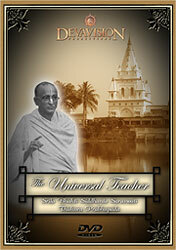 "The Universal Teacher," a documentary on the life and teachings of Srila Prabhupada Bhaktisiddhanta Sarasvati Thakura, was recently produced by Sripad B.G. Narasingha Maharaja and his production team Devavision. According to internet reports, the DVD has quickly gained popular acclaim; at ISKCON Mayapura's first "Vaisnava Film/Video Festival" it was nominated for best script, best editing, best music score, and best graphics and special effects. It has been received in various communities as a dramatic and, at the same time, accurate account of Srila Sarasvati Thakura's life and precepts. The efforts of His Holiness B.G. Narasingha Maharaja and Devavision to glorify the Lord and His pure devotee are praiseworthy. He and his team have shared with the world so many of Srila Prabhupada Sarasvati Thakura�s pastimes, associates, books, articles and other details of his life, in a format which is at once pleasant, entertaining and informative. The statements of caution concerning higher topics are both deeply appreciated and essential to the healthy functioning of our Vaisnava community. Of course, no presentation can ever be complete, and every scriptwriter faces the dilemma of having to be selective in his/her presentation. In the process, certain issues are inevitably privileged and others marginalized. With this in mind, we would like to present another side of Srila Bhaktisiddhanta Sarasvati Thakura's preaching, simply for the sake of balance and completeness. The following article is a humble attempt to complement some of the historical details of "The Universal Teacher," in a similar way that footnotes qualify, clarify and thereby beautify the original words of a text. Our aim is to highlight the natural harmony that exists among all pure devotees, who are also universal teachers. 1. "Unlike other, so-called gurus and siddha-purusas of his time, Sarasvati Thakura did not allow his disciples to discuss the details of Krsna's amorous love with the gopis, although Sarasvati Thakura did indeed have many highly qualified disciples. He was particularly disturbed if he heard of any disciples discussing Rasa-lila." 2. "Sarasvati Thakura also did not allow his disciples to read such books as Gita-govinda, Ujjvala-nilamani or Govinda-lilamrta." 'Always worship the path of raga-marga, spontaneous devotion. Do not rush ahead. Keep yourself a little distant and below. One who transgresses these instructions will be cast down. 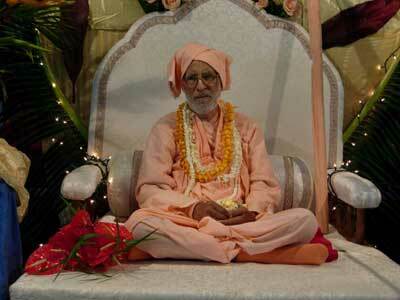 That was the motto of Gaudiya Matha.'" 4. A full-screen display of the cover of Srila Narayana Maharaja's translation and commentary on Sri Gita-govinda accompanied statement 2. The above statements from the documentary might be prone to misinterpretation. An attempt is made herein, to posit a broader context for those statements than the restrictive format of a documentary for general public release would normally allow. An investigation into the documentary�s suppressed themes will surely enhance the faithful reader's conception of Prabhupada Srila Sarasvati Thakura and his mission. "Unlike other, so-called gurus and siddha-purusas of his time, Sarasvati Thakura did not allow his disciples to discuss the details of Krsna's amorous love with the gopis, although Sarasvati Thakura did indeed have many highly qualified disciples. He was particularly disturbed if he heard of any disciples discussing Rasa-lila." Srila Prabhupada Bhaktisiddhanta Sarasvati Thakura began his mission with a healthy conservative emphasis on the fundamental principles of Sri Caitanya Mahaprabhu's teachings. Documented evidence shows that as his mission unfolded he began to reveal progressively advanced topics, all the while making sure that the foundation � guru-seva and nama-sankirtana � was unshakably grounded. It is not surprising then, that we find historical accounts of his wise cautions and prohibitions, most notably recorded in books containing selected statements by His Divine Grace Srila Bhakti Raksaka Sridhara Maharaja, as well as other statements, admittedly fewer in number, encouraging his followers not to remain forever preoccupied with their disqualifications. The ultimate intention of the acaryas is, of course, not to confuse us but to convince us that the higher topics should never be taken lightly, cheaply or independently. Rather, they should be received with nothing less than the utmost respect. As Srila Bhaktivedanta Swami Prabhupada has clearly remarked (Dec. 24, 1969), caution is one thing but "it is not that we have taken a vow to boycott the gopis." A. Srila Sarasvati Thakura supported proper hearing of Rasa-lila. This section includes an excerpt from one of his classes which, although not intended to be representative or typical of his public persona, gives a glimpse of the prospect he revealed to the fortunate recipients of his mercy. B. He wanted his highly qualified disciples to inform the world about Rasa-lila in an appropriate way. For example, Srila A.C. Bhaktivedanta Swami Prabhupada wrote a summary-study of the Tenth Canto Srimad-Bhagavatam, called "Krsna, the Supreme Personality of Godhead." In that summary study there are six chapters concerning the amorous pastimes of Sri Sri Radha and Krsna, including the Rasa-lila chapters. On Srila Bhaktivedanta Swami Prabhupada's order, the Krsna book was distributed in many languages to millions of fallen conditioned souls. C. His most renowned preacher supports appropriate hearing of Rasa-lila. This section is composed of quotes from Srila Bhaktivedanta Swami Prabhupada�s translations and purports on Srimad-Bhagavatam and Sri Caitanya-caritamrta, as well as quotes from his other books, confirming that one should in due course hear rasa-katha from proper authority. One should not hear from mayavadis, sahajiyas or professional reciters. One should not imitate the Lord's pastimes or think oneself artificially advanced or perfect, but one should respectfully hear from authority. D. He taught: Do hear; don't imitate. E. His authorities comment on hearing Rasa-lila. This section contains the statements of Srila Sukadeva Gosvami, as well as the commentaries of Srila Jiva Gosvami, Srila Visvanatha Cakravarti Thakura and Srila Prabhupada Bhaktivedanta Swami Prabhupada. F. Srila Sukadeva Gosvami supports hearing Rasa-lila. This section contains commentaries by Srila Prabhupada Bhaktivedanta Swami Maharaja and other acaryas on Srila Sukadeva Gosvami's verse (Srimad-Bhagavatam 10.33.39), which states that if a faithful person hears Rasa-lila from the right source, lusty desires in the heart will be vanquished. G. Atheists do not believe in Srila Sukadeva Gosvami's verse. Srila Visvanatha Cakravarti Thakura comments that one who refuses to accept the claim of this verse is said to possess an atheistic temperament. H. All Gaudiya Vaisnavas believe in this verse. Self-realized spiritual masters are the asraya-vigraha manifestations of Lord Krsna Himself. Therefore, they have the power and right to know to whom they should speak. This section includes an excerpt from Srila A. C. Bhaktivedanta Swami Prabhupada�s lecture in 1968, on the Appearance Day of Srimati Radharani. I. Who will say not to hear? Srila Bhaktivedanta Narayana Maharaja discusses the four ways to say, "Don't hear Rasa-lila. "Sarasvati Thakura also did not allow his disciples to read such books as Gita-govinda, Ujjvala-nilamani or Govinda-lilamrta." Srila Prabhupada Sarasvati Thakura strongly opposed the independent trespassing of unqualified candidates into our sampradaya's sacred treasures such as Gita-govinda, Ujjvala-nilamani and Govinda-lilamrta. In this regard, we find a consensus between all authentic acaryas. The subject of eligibility has been addressed elaborately by Srila Bhaktivedanta Narayana Maharaja in his introduction to Gita-govinda (see section C below). Therein he stresses that this book is not suitable or even understandable for everyone. However, to postulate that an acarya would banish all of his followers forever from their spiritual inheritance is obviously a misinterpretation. A. Srila Sarasvati Thakura preached Gita-govinda's glories. This section contains excerpts from a discourse in which Srila Sarasvati Thakura explains that the first verse of Sri Gita-govinda anticipates the appearance of Sri Caitanya Mahaprabhu. The excerpt can be found in the Foreword of Srila Narayana Maharaja's translation and commentary on Sri Gita-govinda . B. He wanted the world to properly understand sacred amour. Herein is an excerpt from an article by Srila Sarasvati Thakura found in the book Sri Caitanya's Teachings, which also graces the front matter of Srila Narayana Maharaja's Gita-govinda. This section addresses the question of eligibility for hearing Sri Gita-govinda. D. Srila Sarasvati Thakura did not prohibit his faithful disciples from entering such literatures. This section includes some of Srila Bhaktivedanta Swami Prabhupada's translations from Caitanya-caritamrta, wherein he discusses and quotes verses from Gita-govinda. E. He blessed our Srila Prabhupada. At the end of Sri Caitanya-caritamrta our Srila Prabhupada commented, "I do not think myself a very learned scholar, but I have full faith in the service of my spiritual master, His Divine Grace Srila Bhaktisiddhanta Sarasvati Thakura. If there is any credit to my activities of translating, it is all due to His Divine Grace. Always worship the path of raga-marga, spontaneous devotion. Do not rush ahead. Keep yourself a little distant and below. One who transgresses these instructions will be cast down. That was the motto of Gaudiya Matha." It was not mentioned by the documentary narrator, but it is stated on one of Sripad Narasingha Maharaja's websites that this statement is quoted from Srila Sridhara Maharaja's explanation of a poem by Srila Sarasvati Thakura. Srila Sridhara Maharaja's explanation was not intended by him to be a translation of the verse. Rather, it focuses on the two-word phrase "pujala raga-patha," indicating that the path of raga is worthy of our worship. The implication of this idea is that one can gain a genuine entrance into raga-marga only by mercy from above. There is no other way. Such mercy will not descend upon those who proudly think themselves qualified, but upon those who, realizing their ineligibility, humbly worship raga-marga from a lower position. It goes without saying that in practice it is impossible to worship something that you are absolutely forbidden to hear, speak, remember or read about. So there must also be a preliminary stage before raga-marga proper, wherein one is exposed, in a limited capacity, to the tenets of raga-marga. The rate of exposure is to be determined on an individual basis by one's guru. This section includes an article written about Srila Bhakti Prajnana Kesava Gosvami Maharaja, the sannyasa-guru of Srila Prabhupada Bhaktivedanta Swami Maharaja. The article was written by Srila Bhakti Prajnana Kesava Gosvami's disciple, Srila Bhaktivedanta Vamana Gosvami Maharaja who, after his Guru's entrance into nitya-lila in 1968, became the revered Acarya and President of his institution, Sri Gaudiya Vedanta Samiti. Herein Srila Narayana Maharaja emphasizes the necessity for the utmost respect for the path of raganuga-bhakti. 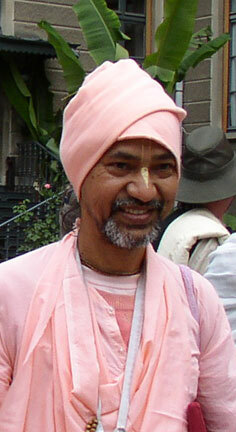 In this discourse, he warns his followers to be careful not to imitate advanced devotees. C. Srila Sarasvati Thakura wants his followers to truly enter raga-marga. Sripad Madhava Maharaja highlights the glory of the verse 'matala hari-jane,' by explaining the profound thoughts inherent in the translation. 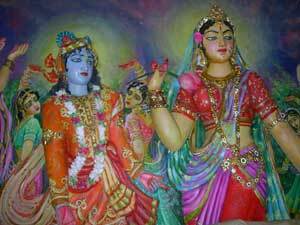 "The servants of Hari revel in satisfying His transcendental desires. They worship the path of spontaneous devotion, whereby awe and reverence is overthrown." Srila Bhaktivedanta Narayana Maharaja explains that this verse applies to the liberated associates of Sri Caitanya Mahaprabhu in this world, who have come here as raganuga-bhaktas. Sriman Mahaprabhu appeared in this world along with His associates. This verse refers to His associates who were with Him during His time, as well as to all those who appeared after Him. Srila Bhakti Raksaka Sridhara Maharaja explains: "'Pujala raga-patha gaurava bhange.' This is Bhaktisiddhanta vani [teachings]. 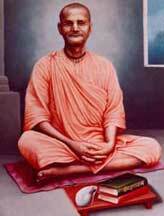 The real existence of Bhaktisiddhanta [bhakti-siddhanta] is there." Some visuals were shown along with the narrator's statement: "Sarasvati Thakura also did not allow his disciples to read such books as Gita-govinda, Ujjvala-nilamani or Govinda-lilamrta." When the narrator said the word "Gita-govinda," there was a full-screen showing of the cover of Srila Narayana Maharaja's translation and commentary of Sri Gita-govinda. However, he decided to display the work of Srila Narayana Maharaja, along with a warning not to read it. Are we to take this as a charitable act of free publicity? If so, we are grateful. He could have mentioned that the book on the screen begins with an extra thirty-five pages of warnings to support his own, yet his failure to do so unnecessarily portrays the book and its commentator in an objectionable light. By token of the same logic, Sri Jayadeva Gosvami, the original author of Sri Gita-govinda, along with Srila Rupa Gosvami and Srila Krsnadasa Kaviraja Gosvami (the authors of Ujjvala-nilamani and Govinda-lilamrta, respectively) also stand inadvertently condemned. Further, in his Krishna-talk website article, Sripad B.G. Narasingha Maharaja goes on to confuse the act of publishing a confidential book with endorsing its indiscriminate study, as if the two issues were the same. Little can be said to address such non sequitur without running the risk of accrediting it with substance. The question may be asked in a general sense: Why do acaryas publish or even write confidential books in the first place? They know that most of us are not qualified. Still, like affectionate parents who bequeath their treasures to their beloved children on the condition of their coming of age, our merciful acaryas leave the priceless transcendental treasure of their realizations in books for their disciples to relish when, one day, they are mature enough in their bhakti to deeply appreciate them. Are we to construe their generous provision for our future an incriminating act of sahajiyaism? Better we accept it with a properly adjusted sense of responsibility.sibility. This section addresses the question:: Historically, why do the great acaryas in our disciplic succession publish or even write confidential literatures, knowing that most of us are not qualified to read them? In this connection the respected reader is invited to log on to Srila Narayana Maharaja's website, www.purebhakti.com. About 500 of his lectures are posted on his website, showing how he is carefully cultivating bhakti � from the beginning � in the hearts of the conditioned souls. C. Regarding the title "Unconventional Teachers"
This section discusses the reason for our titling this article and website "Unconventional Teachers." All of the self-realized acaryas in our disciplic succession � from Lord Brahma to Srila Vyasadeva to Sri Caitanya Mahaprabhu to Srila Sarasvati Thakura Prabhupada to his pure followers of the present day � are universal teachers and "unconventional teachers" at the same time; and this section explains the deep significance of this. We pray that the repetition of our worshipful acaryas' statements will be pleasing to them, so that they may mercifully bless the entire community of aspiring Vaisnavas with a greater level of clarity, forgiveness, harmony and respect for each other.